A beeping sound from my cell phone woke me up at 2:15 AM. I only had time to freshen up and grab my backpack. Jeeps took us a bit closer to the mountain. From there we continued on foot. The plan was to get to the top of Mt. 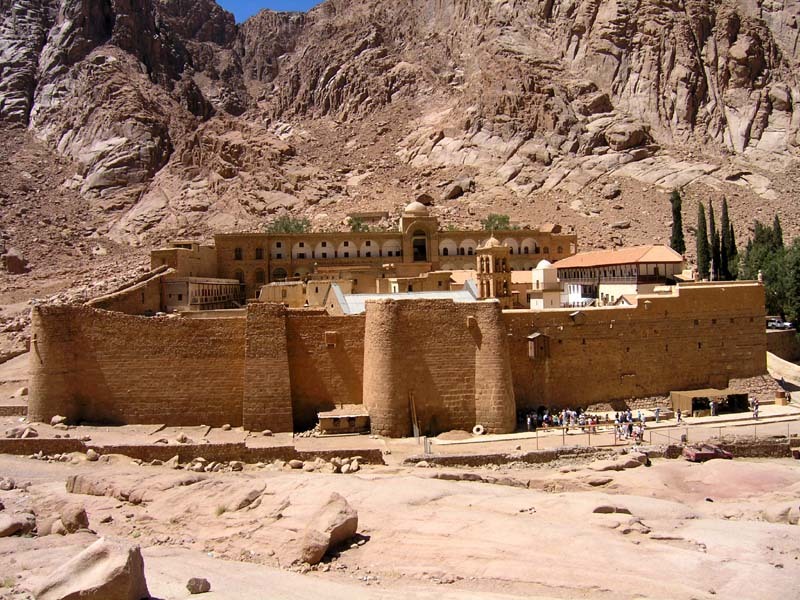 Sinai (aka. 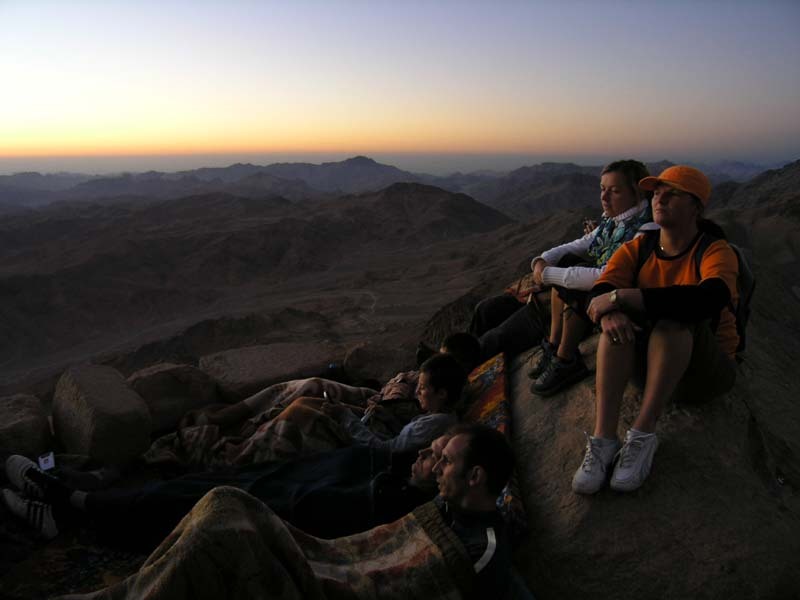 Mountain of Moses) and enjoy a beautiful sunrise at 2288 meters above sea level. On the way up we tried to ignore many Bedouins offering a camel ride to the top. There was a camel on almost every turn to the top. And let me point out that the winding path had countless turns. We made it to the top in time to have a cup of tea and to sit around for a while in the peaceful atmosphere before the night started turning into a new day. There are a whole bunch of teahouses at the top, so it wasn't too difficult to find a cup of tea. The sunrise was was just magnificent. I think there was nobody around that could resist taking photos... Many photos. There is also a cute little chapel on the top (Mount Moses Chapel). As our guide told us we were lucky to find it unlocked. On the way down we stopped at the St. Catherine Monastery. It was built by order of Emperor Justinian in 6th century A.D. to enclose a chapel standing at the site where Moses is supposed to have seen the burning bush. The bush (supposedly the original one) is still there today. It is a unique kind of blackberry bush that can be found nowhere else in Sinai. The monastery's library keeps the second largest collection of early codices and manuscripts in the world, outnumbered only by the Vatican Library. 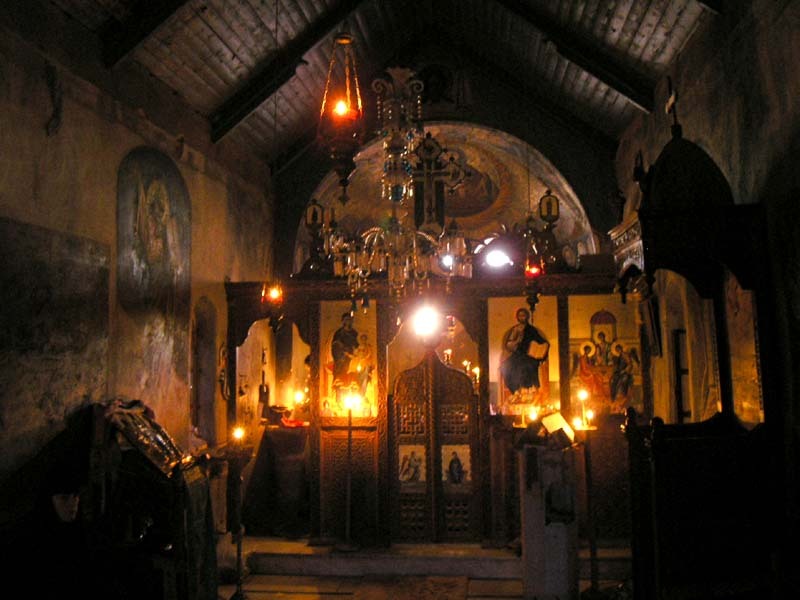 In addition to that it also houses many mosaics, the best collection of early icons in the world, a bunch of chalices and reliquaries and so much more. 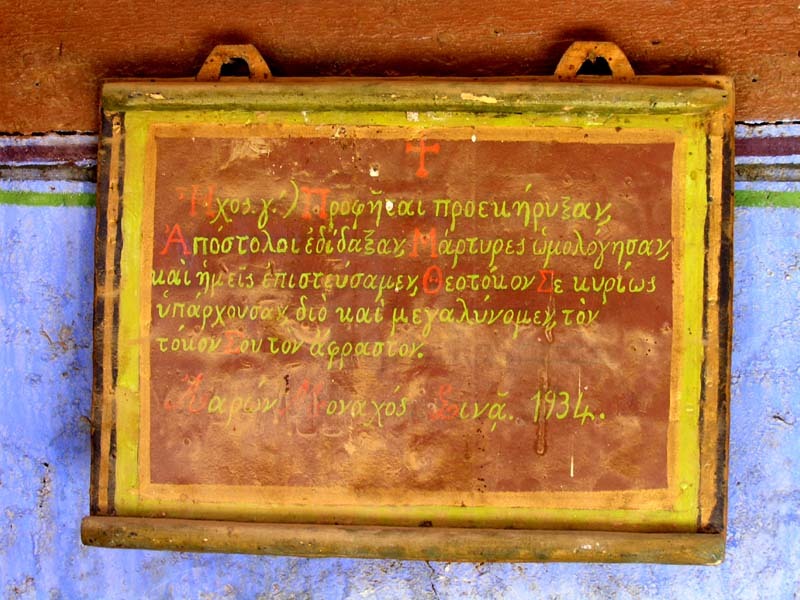 Because it is a Greek Orthodox monastery the majority of inscriptions are in Greek. The tour of the Monastery of St. Catherine was followed by a breakfast at our hotel. After that we were off to the desert. The Bedouins provided a couple of Toyota jeeps together with two drivers, a cook and supplies for three days. The original plan was to stay in the desert for three days, but once again Allah disagreed. Malesh. The official explanation was that the government was having troubles with some of the Bedouin clans. All tourists were forbidden to spend the night in the desert until the disagreement was resolved. We tried to make the best of the situation and decided to spend the two nights on the edge of the desert in a small town of Nuweiba. On our first day in the Sinai desert we went exploring an interesting little canyon, visited a Bedouin desert settlement and stopped at a desert well, still in use today.